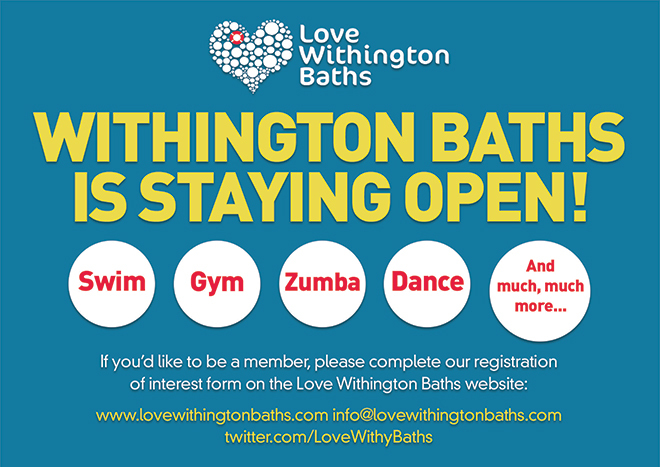 You can’t have missed us banging on about the group we’re involved with, Love Withington Baths. Our community group will be taking over the running & development of the facility, once GLL (the current operators), take over at Hough End. We are at a very critical stage in the long take-over process, as we finalise the legal documentation, staffing, classes, repairs & maintenance schedules etc, but most importantly, make sure we have members to help us to realise our dream/vision of a community focused health & fitness/heritage centre. If you would like to be a member, and be a part of a very exciting future, please register your interest here. We will be contacting all members asap re classes, prices & packages. If you are a current member, and you register before 31st May 2015, we guarantee to price match your current package.